One Momma Saving Money: Fannie May/Harry London Chocolate Tours #FREE #Ohio - Fun for Spring Break! Fannie May/Harry London Chocolate Tours #FREE #Ohio - Fun for Spring Break! Did you know that Fannie May/Harry London Chocolate offers tours and they are free!!!! During the 45 minute guided tour, visitors will learn about Fannie May's rich heritage of making fine chocolates. 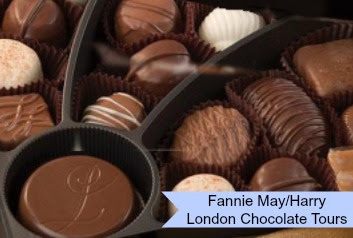 Your Fannie May/Harry London chocolate journey begins with a short video presentation highlighting key moments in the Fannie May and Harry London history. While on tour, you learn the history of Fannie May, learn about the process of cocoa beans transformation into chocolate and more! Your tour ends in our chocolate shop for fabulous Fannie May and Harry London chocolates with a FREE tasting of our famous chocolates. Treat yourself to an assortment of chocolates, fresh dipped chocolate covered strawberries or a refreshing dish of gelato. Large groups of over 20 visitors do require you to call ahead for a reservation.